Church groups, scouts, school kids, college students, mom groups, your golf or tennis buddies, or any other group you belong to, are invited to volunteer together at The Scrap Exchange. We also offer service opportunities for business organizations and group educational service-learning opportunities. Groups of children and teens are always welcome but must be accompanied by an adult group sponsor. Group opportunities are typically designed for 4-12 individuals at a time. We can accommodate larger groups, contact us for more information. Group members must be at least 16 years old to participate. Chaperons are required if group members are under 18 years old. Groups may volunteer Monday-Saturday. Shifts are typically 11:30 am – 2:00 pm and 4:30 pm – 7:00 pm. We can accommodate various shift times upon request. Interested in group volunteer opportunities? 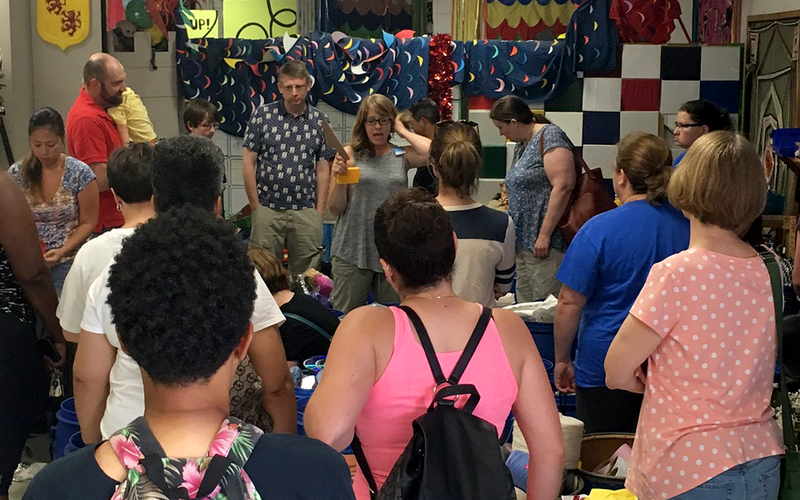 Please contact us at volunteer@scrapexchange.org about your group and interests.